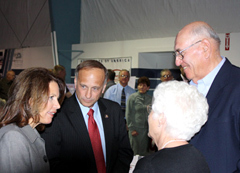 Minnesota Congresswoman Michele Bachmann headlined a fundraiser for Congressman Steve King this weekend. The two Republicans helped organize some of the recent “Tea Party” rallies in Washington, D.C. and both favor repeal of what they call “ObamaCare.” On Saturday night in northwest Iowa, Bachmann called King her “best friend in congress” and King lauded Bachmann for her political instincts. About 500 people paid $50 per ticket to hear Bachmann and King speak at a meeting hall in Sergeant Bluff, a Sioux City suburb. Bachmann told the crowd she is a native Iowan who pleaded with her parents not to move north. Bachmann’s mother was from Mason City and both her parents were graduates of Waterloo East High School. Bachmann, who was born in Waterloo, lauded the State of Iowa and the Iowa Caucuses which are the first contest in the presidential selection process. King said he wants to “test” the candidates who are considering a run for the White House to find out if they’re a “rock-ribbed” conservative.